Awami League general secretary Obaidul Quader on Saturday said BNP’s efforts to make the December-30 election questionable by sending letters to different countries have failed. “BNP is lonely trying to make the election questionable. They’ve written letters to different countries to brand the election as illegal and questionable one. But, such evil efforts have gone in vain,” he said. He came up with the remarks while talking to reporters after visiting the construction work on the second Kanchpur Bridge in Narayanganj. 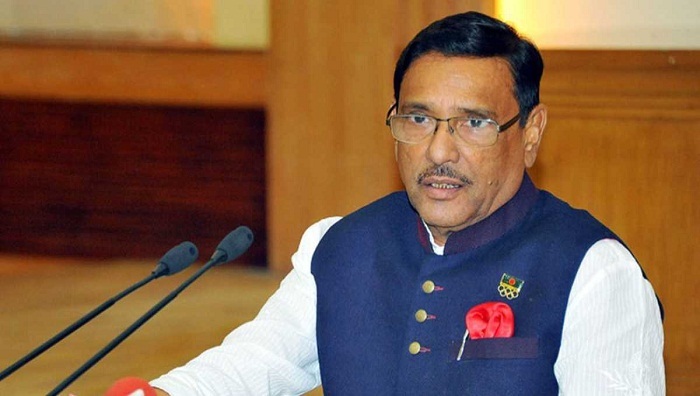 Quader, also the Road Transport and Bridges Minister, said BNP has lost the confidence of foreign friends and the country’s people by hatching a conspiracy against the country. He criticised BNP for its decision to boycott the upcoming upazila polls, saying a political party loses its normal existence if it does not join elections. The Awami League general secretary hoped that their party will not face any trouble with rebel candidates in the upazila polls like the national election. The minister said the construction work on the second Kanchpur Bridge has almost completed and the Prime Minister will inaugurate it anytime next month. Besides, he said, around 85 percent construction work on the two other new bridges --Meghna and Meghna-Gumti – has been completed and those will be opened by June or July next easing the sufferings of commuters on Dhaka-Chittagong Highway.